Jankidevi Bajaj was born on 7th January 1893,here, as this was where in a respectable Vaishnav Marwari family of Jaora in Madhya Pradesh. Jaora was ruled by Nawabs at that time. Her father, Shri Girdharilalji Jajodia was a follower of Shri Ramanuj Sampradaya. The whole family followed the Hindu religion with complete faith and devotion. They were wealthy and equally generous. People from all classes, castes and religions benefited from them. Jankidevi had an elder brother, Chiranji Lalji and a younger brother, Purushottam Das. Her mother, Maina Devi was the epitome of simplicity and tenderness. She helped not only the neighbours but also her servants in their work. Under this influence, Jankidevi adopted the Ekadashi Vrata and started reciting Om Namo Narayanay in solitude, from the tender age of 6 -7 years. She regularly performed Puja and visited temples and also recited Vishnu Sahasra Nam. She was adored by all and received a lot of fond attention in the joint family. Jankidevi's childhood was spent in such noble influences of a loving family life. Janki was a product of the then contemporary social beliefs and tradition and she had no opportunity to receive formal schooling. However at the age of 6-7 years, she was fascinated by the idea of 'talking paper' and wanted to learn reading and writing. Janki's desire impressed Shri Girdhari Lalji and he arranged to educate her at home. She was impacted by her mother's caring ways and was extremely capable. She was an expert in knitting and embroidery and was very eager to learn and understand everything. Wardha in those days had the glitter of Seth Bachhraj's glory. All he lacked was a child. For generations the family lineage had been maintained by resorting to adoption. The adopted son Ramdhan Das too departed and Seth Bachhraj went to Kashi ka Vas (Rajasthan) and adopted Jamnalal, the four-year-old son of Shri Kaniram Bajaj (no relation). 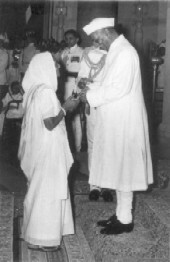 Jankidevi was chosen when she was a four-year-old child, as a match for Shri Jamnalal Bajaj. At the age of eight and a half years, she got married to him and Janki became Jankidevi the Grih Laxmi, the Lady of the House in the Bajaj Family. After their marriage, she came to Wardha in 1902. Even Shri Jamnalal Bajaj probably had no idea that the innocent girl he had brought home as his bride, would go on to become a shining inspiration to the Bajaj family, the society and the country. The foremost personality among those who deeply influenced Jankidevi, was her husband Shri Jamnalal Bajaj who was not only a rich businessman, but also a religious devotee, a follower of Mahatma Gandhi, a social reformer, a staunch Nationalist and a worshipper of the Cow. The progressive husband initially taught his bride at home and increased her general knowledge by having a Parsee lady read newspapers to her. So began the marital life of Jankidevi; decked in ornaments of gold, silver, pearls and diamonds. In due course she gave birth to five children, two sons and three daughters; Kamla (27-8-1912), Kamalnayan (23-1-1915), Madalsa (27-7-1917), Uma (Om) (12-7-1919) and Ramkrishna (22-9-1923), in that order. The issueless lineage of Shri Bachhraj came alive with young chatter. Jankidevi became engrossed in bringing up the children and looking after the household duties. Her husband's greatness gradually unfolded before her. Inspired by his noble thoughts, Jankidevi, who was brought up in a traditional family gave up the parda in the year 1919. Adopting simplicity, the greatest ornament in the world, in the year 1921 at the age of 28 years, she gave up all the ornaments. At the same time, she also gave up the use of foreign garments and embraced swadeshi Khadi. This action which appears easy today; was a revolutionary step in those tradition-bound times. Jankidevi had to face society's displeasure and social boycott. She was impressed by Jamnalalji's constructive work in the field of Promoting Khadi, Serving the villages, Participating in the Freedom Struggle, Goseva, Women's upliftment, etc. and forsaking the comforts of affluence, she readily followed the footsteps of her husband. India in those days was in the shackles of foreign rule. Gandhiji's revolutionary call for Truth and Non-violence to bring about consistent progress for the Nation as well as the society influenced many men and women and Jankidevi was one of the first to follow. What is the essence of Life? Is there anyone who practices what he preaches? Shri Jamnalal pondered over such issues and was always searching for the right personality. And in the year 1915, his search led him to a guide, the unparalleled Gandhiji. The Bajaj family accepted Gandhiji with complete faith and commitment. In the year 1921, inspired by Gandhiji, Jankidevi burnt foreign clothes being used in and out of the home. She clad everyone in Khadi. Through the day and the night, she worked on the Charkha and the spindle and went from house to house teaching spinning of the Charkha. The potential lying within her was expressed manifold in the company of Bapu. Her creative talent took a constructive turn and love for the motherland became dominant within her. Economy and optimum use of every object became part of her way of life. She spent every moment of her life in constructive work and brought her conviction to life. Shri Jamnalal became the fifth son of Bapu in 1920 and I his fifth daughter-in-law. Khadi revolutionised the religious bent of my mind and filled it with love for the country. Since then Khadi, the Gomata and donating wells - Koopdaan - have become the pillars of my life. Cow begets the bull who tills the land and the land feeds all life, provides Khadi and freedom. This is the essence of my life. Participating in the freedom struggle along with the family, betterment of Harijans and working for their free entry in the temples (in 1928), women's development and Goseva constituted her life. Saint Vinoba Bhave was the spiritual guide for the Bajaj family. The enlightened Vinoba was won over by the childlike simplicity of Jankidevi and he became her younger brother. Thus Jankidevi, with her love and affection, got the right to bless the Baba (Vinoba Bhave) whose blessings the world sought. Death of her elder son Kamalnayan in 1972 was a big blow to her. Here is when she took refuge with Shri Vinobaji. She would go daily to Paunar Ashram where Vinobaji would write one name from 'Vishnusahasranaam' (1000 names of Vishnu) in a graphical form and explain the same to her. The same has been subsequently printed. "I was not an educated person; but life became an enlightenment in the company of these two great personalities. I am moved by their thoughts. A sea of bliss encompasses my inner self." Under the influence of Gandhi and as a true disciple of Vinoba Bhave, she became a source of inspiration for others to follow. Her personality went on improving with many noble characteristics and her actions had their firm approval. Both Gandhiji and Vinobaji took active interest in her development. The whole character of Jankidevi acquired a wonderful aura on account of the company and the sound advice of Bapu and the affection and blessings of Vinoba, as also the self-discipline and constructive creativity she herself had. She became the first among the Gandhian social workers of her time. Love for the country was everything for her. She followed her husband Jamnalal Bajaj in the freedom struggle and did not lag behind in any constructive activities. Thus she attended large meetings and gave passionate speeches without fear. She also inspired her offspring to devote themselves for the country. 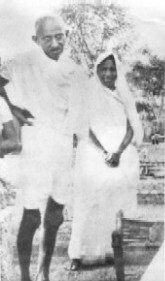 The elder daughter Kamla accompanied Jankidevi on her Bihar trip and gave speeches; the elder son Kamalnayan, too actively participated in the freedom struggle in the year 1930 and was imprisoned in 1932 and had to face solitary confinement. The youngest son Ramkrishna was initially denied permission by Gandhiji on account of his young age; but took part in the Satyagraha and went to jail in 1941 and 1942. In the year 1942, in the 'Do or Die' movement her daughter-in-law Savitri who was born and brought up in an environment of opulence also went to jail and suffered hardships. Jankidevi herself went to jail in the year 1932 and had to bear police brutalities. Thus the entire family of Jankidevi took up the path of patriotism. The tiny spark of patriotism, which she had generated, shone with increasing brightness. Children never saw her ruing nor weeping and so they were inculcated with the ability to face every hardship with a smile. The simple-hearted Jankidevi was thoroughly selfless and always remained away from the limelight. With Bapu shifting to Wardha on 5th April 1934, leaders and workers started coming to Wardha in increasing numbers. It was here that Gandhiji established Gramodyog Sangh. Bapu shifted his residence to Sevagram after Magan Wadi. 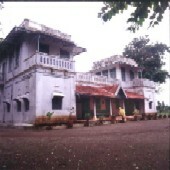 Bajajwadi was established in 1934. Bajajwadi became a convenient venue for meetings of Congress Working Committee as also other constructive activities. It was the meeting place of the National and international visitors, journalists, leaders and workers. Bajajwadi also provided haven to unknown personalities. Their needs and comforts were well looked after. Long discussions were held during the morning and evening meals when leaders, family members and others sat together. Even today people remember those days. Small and large meetings of All India Congress Committee were held at Wardha. It was Jamnalalji who gave instructions for taking every care of every convenience for the top leaders of the country; but the credit he gets for this, should be largely shared by the support he received from Jankidevi and her complete cooperation and eager participation in welcoming everybody and her will to share the responsibility. Whatever the gathering, Mataji was always present and was paying attention to the comforts of the hundreds of members, which surprised everybody present. Today, Bajajwadi is still revered as a national treasure and cherished by Wardha as a historical monument. Jankidevi Bajaj was truly devoted to work, a real Karma Yogini. In 1956 she was awarded by the Government of India the honour of 'Padma Vibhushan', which was conferred on her by President of India Dr. Rajendra Prasad. Awards and ornaments paled before her personality. In effect, it was the expression of gratitude and respect, which the Government of India showered on behalf of the people of India. The nation was gratified to show reverence for her. Even during the last year of her life, Jankidevi actively participated in Vinobaji's agitation against cow slaughter. She fell when she was walking on the terrace in a pensive mood and sustained a fracture. Doctors rushed from Mumbai, but to no avail. On 21.5.1979 Jankidevi was laid to eternal rest at the 'Geetai Mandir', Gopuri in Wardha. It is not necessary to carry my ashes to Sangam (Prayag) or to Haridwar or some such holy place. As far as I am concerned, Gopuri is the ultimate pilgrimage. The place where Jamnalalji himself, while serving the Gomata, has been laid to eternal restis the holiest of holy places for me. Jankidevi was a tireless Gandhian social worker whose whole life was devoted to fulfilling Gandhiji's fourteen-point constructive programme. An eminent patriot, Jankidevi was a close associate of Mahatma Gandhi and pillar of strength to her husband Shri Jamnalal Bajaj. Nobody can substitute a mother and Jankidevi was virtually a mother to a very large family and constructive enterprises. The work she did in the field of betterment of cows will always be remembered. A distinguished representative of Indian womanhood Smt. 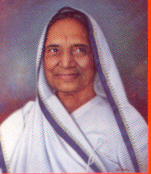 Jankidevi Bajaj had worked for awakening and emancipation of women. With her demise we have lost an eminent and dedicated social worker that ceaselessly worked for the cause of Bhoodan movement and ban on cow slaughter. We have just heard that your mother has expired. She was suffering and is now released after living a purposeful and virtuous life. All my condolences and sympathies. A great Gandhian woman, who spent herself in the service of her country. Jankidevi has little formality. Truth, honesty and integrity are the pillars of her character. She is full of childlike qualities of guilelessness and lack of falsehood. From the time I have known her, she has always been the same in her behaviour. Even in the prime of youth, in spite of all the wealth, her simplicity sometimes appeared better than the sisters in the Ashram. She had no trace of pride and was completely removed from that kind of failings. I wish to have the entire atmosphere of the Bajaj family glow with the fragrance of Jankidevi's noble character. Just as it is not possible to fully understand Gandhiji without knowing the life of Jamnalalji; it is impossible to truly comprehend the imprints and the services of Jamnalalji and the Bajaj family. I vividly remember the motherly love of Ma, which had the purity of Ganga Jal. She manifests to me in her smiling, candid demeanour. It is unbearable to accept that my dear mother will never again call me in her loving voice.